Published by: (Unknown), Alga, Basic Fun, Inc.
Alternate Names: Clue/Parcheesi, Clue: Alfred Hitchcock Edition, Clue: Family Guy Collector's Edition, Clue: Juicy Couture, Clue: Scooby-Doo! Where are you? 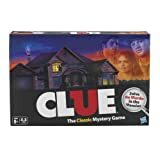 Clue, also known as Cluedo, is a murder-mystery solving game where players try to figure out the three main facts of a murder: the murderer, the location of the murder, and the murder weapon. They do this by clever deduction. 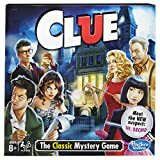 Their characters run around a board, which represents the rooms of a large mansion, to gather evidence to narrow down their list of 6 suspects, locations and murder weapons. The game is played by 3 to 6 players and each player is one of the six characters (Mr. Green, Prof. Plum, Miss Scarlet, Mrs. White, Col. Mustard, and Mrs. Peacock) in the game. The nine possible rooms are the Study, the Hall, the Lounge, the Library, the Dining Room, the Billiard Room, the Conservatory, the Ballroom, and the Kitchen. The possible weapons are the Knife, Revolver, Rope, Lead Pipe, Candlestick, and Wrench. The murder will occur in any of the 9 rooms, using any of the 6 weapons (dagger, candlestick, revolver, rope, lead pining and spanner) by any of the 6 characters. Someone draws at random a suspects card, a weapons card and a room's card. The cards will be put into a secret envelope and is the solution of the crime. Next, the remaining cards will be shuffled again and being distributed among the players. The players can look at their cards and cross off them from the list that contain all suspects, weapons and rooms. Each character has a designated spot from where he or she has to start. Then the game begins by players rolling the dice and going into rooms. When a player enters a room he or she gets to make a guess on who committed the murder and using what weapon in that room. The other players will try to prove him or her is wrong by showing cards if he or she has them. The cards he or she sees will then be struck off the list he has. This goes on and on until finally someone is left with just one poker clue and is able to guess about who the murderer was, what weapon he or she used to kill the person, and in what room he murdered that person. You get to pretend you're Sherlock Holmes or Hercule Poirot. And there are so many possibilities of who, where, and with what weapon, that the mystery changes every time you play. You can experience the escape and enjoyment of playing a game while collecting the right information and making the correct deductions in order to solve the mystery. 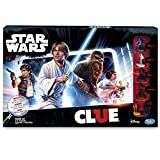 Clue is a great detective game and suitable for players of age 8 and up.